Our work in Eastern Europe continues to grow in maturity and number. Under the direction of Sorin Prodan, Don Currin, and thirty-two dedicated missionaries, souls are being won for Christ; established churches are being strengthened; and new church plants are rising up. On several university campuses in Romania, students are hearing the gospel and being discipled. As the promised hope of European unity and prosperity crumbles and gives way to cynicism and despair, the light of the gospel continues to point to the only One who is truly worthy of trust. In times of greatest darkness, the light of the gospel shines forth with the greatest clarity. Although it is our strong desire to continue the advance into Eastern Europe, in this last year, God has increasingly brought the needs of Western Europe to our attention. In many ways, Western Europe is now darker and more ignorant of the gospel than its Eastern counterpart. Countries which were once bastions of the Christian faith and centers for worldwide evangelism are now barren of gospel truth and in desperate need of missionaries. In 2012, God opened the door for us to support missionaries in Scotland (1), Finland (1), and Germany (2). It is our prayer that from this small beginning, God might extend our tent pegs to do more in each of these countries and to expand into others. At the moment, we also have Italy, Portugal, and Spain on our radar, and we are praying for God to open a door. To give you an example of the great need and the work in Western Europe, we have included below a year-end missionary report from missionaries Andy and Sarah Dalrymple who are church-planting in Scotland. To all our dear friends at HeartCry and Radford Fellowship. Greetings to you all in the Name of our Lord and Saviour. Here at Grace Community Church, Dunbar, we continue to thank the Lord for all your lovingkindness towards us and the constant encouragement we receive from you as we seek to work together in seeing His kingdom extended. It is now fourteen months since we launched this new work, and we want to give you an idea of how the first year has gone. As you are no doubt aware, Europe is in a very difficult situation spiritually with probably fewer true believers per capita than any other continent in the world. France, for example, is thought to have around ten thousand towns with no gospel witness whatsoever. Scotland also has its own problems. Although some ministers and churches remain faithful, many have departed from the gospel, as have some denominations – the government is aggressively secular, hoping to introduce gay marriage next year, and the people are for the most part biblically ignorant. Church attendance on Sundays is abysmally low, around 5%, and it is estimated that only 4 out of every 100 young people attend any kind of church, never mind a gospel one. The town where we are situated pretty much reflects this problem. 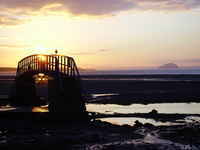 Dunbar is about twenty-five miles east of Edinburgh in the beautiful county of East Lothian. It has a population of around 9,000 people (12,000 including surrounding villages) and is geared for growth, with plans for another 800 new homes in the near future. The fact that it is only twenty-two minutes from Edinburgh by train has turned it into something of a commuter town. The Lord has placed us in an area where there are many challenges, but we truly believe that He has people in this town who will respond to the gospel. Since we first looked at Dunbar as a possible location for the church plant, a new minister has come to the local parish church, and he has a testimony to God’s saving grace. He has been very supportive of our presence and gospel aspirations, but the others in town have not, especially when we refused their invitation to be a part of the local ecumenical movement. This has given us a lot of negative press in some circles, but we are determined to hold our ground and honour God. “Grace” is a plant out of Musselburgh Baptist Church. A handful of its members were travelling a long distance into the mother church, and through time, it was decided to use them to form the core of a new work further down the coast. We met in various homes for around two years and then launched at the end of August, 2011. Since then, the Lord has enabled us to rent a couple of rooms in a local sports community centre on Sundays, and during the week, we meet in our home for prayer and Bible study. Very quickly, a number of other believers in the area started to show an interest in what we were trying to establish, and we have had quite a few come along and take a look. Some have stayed only for a short while, but others have stuck with us, and today we can expect to have around thirty-five in attendance on Sundays, including about twelve primary-school-aged children. These folks are from a variety of backgrounds, and they bring with them very different perspectives and experiences, which presents some challenges from time to time. However, the Lord has been very gracious to us and we have been enjoying warm fellowship together. During our first church year, we have tried to be as active as possible in our sharing of the gospel and in creating an awareness amongst the locals that we are around. We have taken advantage of special events in the calendar to distribute gospel literature and have managed to cover the town and surrounding villages on four separate occasions, giving out up to 20,000 tracts or booklets.We also hosted an evening with Dr. John Blanchard, who addressed the topic, ‘Where is God when things go wrong?’ Around 130 people attended, and quite a number left with gospel literature to read. 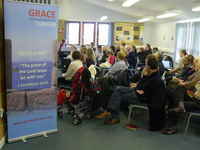 Some evangelistic courses have been held along the way, usually on a one-to-one basis; but as yet, no-one has been converted. Personally, I have tried to stay active in the community, talking to people on their doorsteps about the gospel and visiting them in various contexts. My goal is to visit every home in the town over the next couple of years and introduce myself as the pastor of the new church, hoping that will lead to some gospel conversations. Now that we have a new pastor in Musselburgh and I no longer have to look after both situations, I can give my time more fully to this. Entering into our second year will present some significant challenges and opportunities as we seek to press on. There are a number of matters that we hope to develop and work towards. We have also begun to examine ways of supporting missions overseas, even in some small ways. We receive a great deal from others, including yourselves, and want to create a culture from the beginning of investing in God’s work in other places. Our goal is to eventually be able to support gospel work on each of the world’s continents. At this stage, we are putting in place support for a church planter in Burma and a ministry in Africa that supports local pastors in the provision of a small library of books. These projects are quite achievable for us at this stage and helpful for us in terms of creating a world vision. 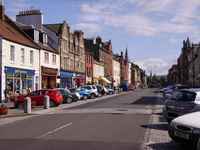 One of our greatest weaknesses as a group is that most of us are not living in Dunbar itself, but are in the outlying areas. Our prayer is that a few more of us might be able to relocate and that the Lord might begin a saving work in the lives of local residents. A major emphasis in our second year will be for members of the group to look for ways to get more involved in the community and the lives of local people. Hopefully, as we seek to make inroads, the Lord will provide opportunities to witness. We are so grateful for the support and prayers that we receive from everyone at HeartCry and the Radford Fellowship. Please give our warm regards to everyone. Please continue to remember us before the Lord. Without Him we can do nothing, and in light of that, we want to assure you of our prayers for the good work you all continue to do in Virginia and beyond. Many of the churchgoers live outside of Dunbar proper. Pray that God might open doors for them to move closer. Pray for opportunities for members to invest in the lives of people within the community. Pray for the church as it moves toward formal establishment and for the spiritual health and unity of the group.